Just as was the case yesterday I went out for another walk to enjoy the lovely fall weather. I followed my usual m.o., e.g. ; taking subway somewhere (in today’s case the Jefferson Street stop of the L) and walking home. This may not be everyone’s idea of a good time but I enjoy it. 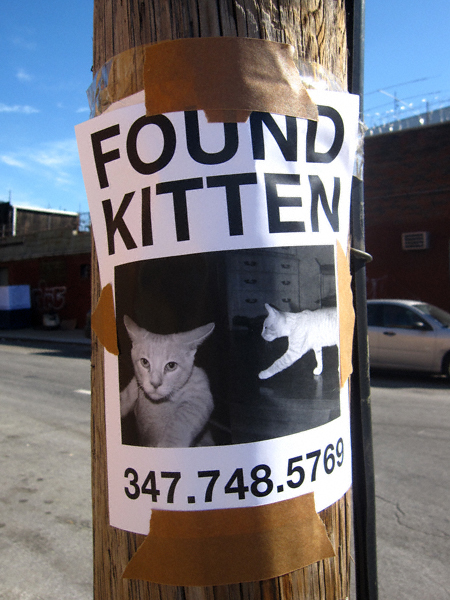 Today was no exception save one disturbing trend: the numerous lost pet fliers I found along the way. Here they are— along with a few furkids who were lucky enough to be found by some very kind humans. Notes/observations: I found a number of these fliers around the Morgan Avenue stop of the L so it is safe to presume he was probably found in this area. Notes/observations: Judging from the condition of the flier I’d say this one has been around for a while. I found it around the corner from where Meatball calls home: Roberta’s Pizzeria. 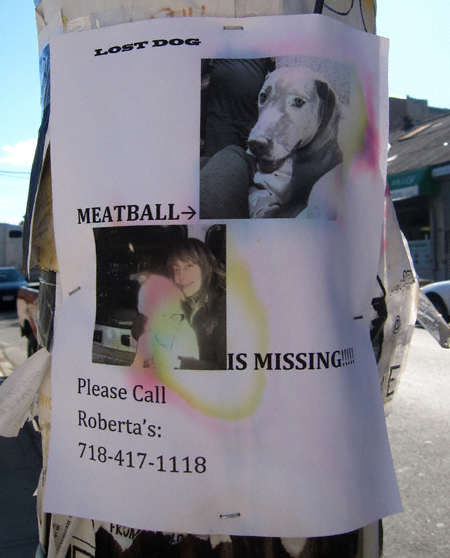 If you have seen Meatball— the coolest named dog EVER— please call his people at the above telephone number. Notes/observations: This is disturbing as hell. Notes/observations: This one hails from a little closer to home: Herbert at Monitor Street. 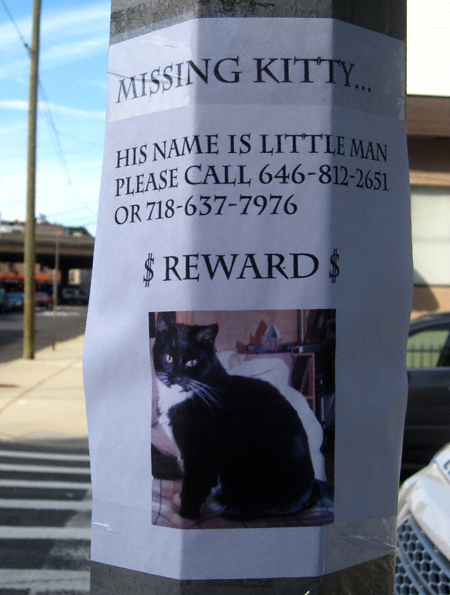 If you have seen Little Man (which happens to a nickname for one of yours truly’s felines) you know what to do. Notes/observations: Although the flier was found at Calyer and Eckford Street, Bella was last seen at Manhattan Avenue and India Street. 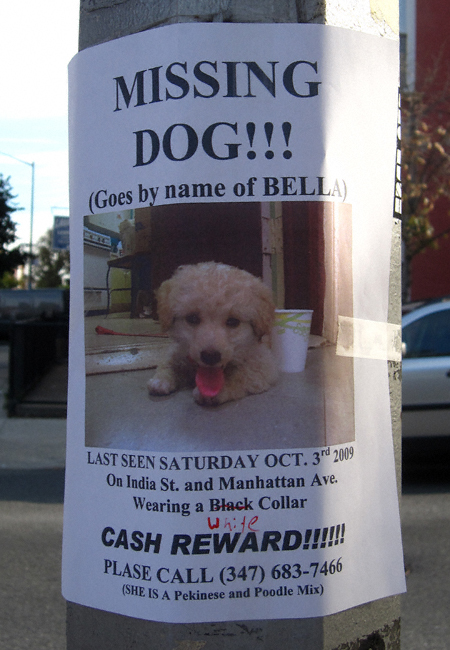 Judging the wording of this flier I have to wonder if Bella was lost or stolen. Stealing pets for resale (or reward money) is a cottage industry in Brooklyn. I’ve said it before and I’ll say it again: KEEP AN EYE ONE YOUR PETS. DO NOT LEAVE THEM UNATTENDED. PEOPLE CAN AND WILL TAKE THEM!!! 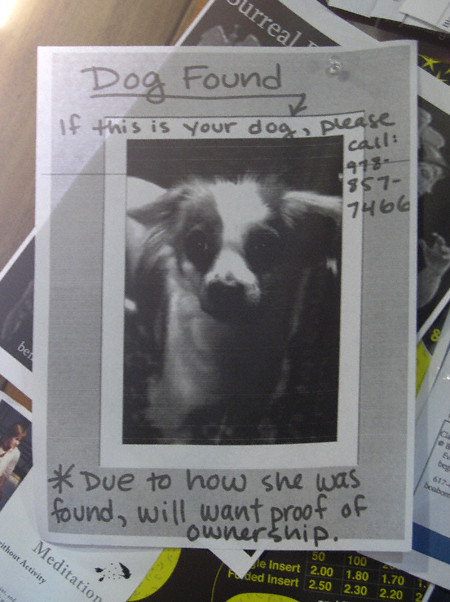 In closing I will leave you with this lost dog alert from my friends at District Dog. RED WENT MISSING ON FRIDAY NIGHT. HE IS A 1 YR OLD RED LABRADOR, HE IS NEUTERED AND HAS A BLACK SPOT ON HIS TONGUE. HE WAS LAST SEEN HEADED OVER THE PULASKI BRDGE TOWARDS L.I.C. PLEASE PASS THIS TO EVERYONE YOU KNOW IN THE AREA. One thing that also makes me very sad is the amount of sweet strays there are that have no help, not unsocialized ferals but friendly strays that could be rehabbed into pets via foster families or a rescue organization. I think the ones on Oak could easily be good candidates, they are very friendly and good with people. But I’ve yet to find a responsive cat rescue organization here because many are busy or strapped for cash, especially with the economy. 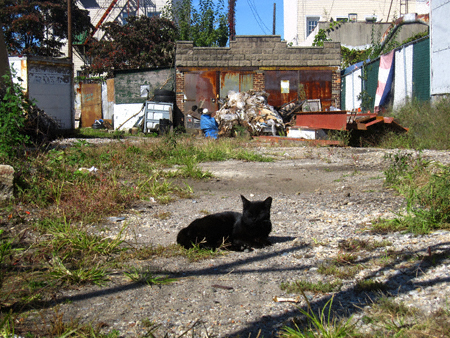 The most recent heartbreaking thing I saw was in the Bronx – 3 tiny kittens in a front yard of a business with their mom still nursing them, one kitten had an eye gummed up shut probably due to an infection and because it’s a stray, the infection will likely kill it. 🙁 I wish we could pair up some lost pet owners who never get their pets back with rehabbed strays…maybe once my Master’s program is over I will try to start a “matchmaking” organization myself! I do hope these people find their lost pets/family members!